"Making the most of simple, fresh ingredients found at your local Farmer's Market, these quesadillas make great appetizers or a quick and healthy meal. Serve while hot with your favorite salsa, sour cream, and guacamole." Coat the same pan with cooking spray, and place one tortilla in pan. 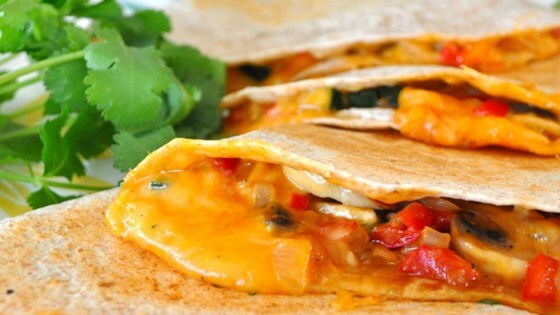 Sprinkle 1/4 cup of cheese evenly over tortilla, and layer 3/4 cup of the vegetable mixture over the cheese. Sprinkle another 1/8 cup of cheese on the vegetables, and top with a second tortilla. Cook until golden on both sides, for approximately 2 to 3 minutes per side. Remove quesadilla from pan, and repeat with remaining ingredients. Cut each quesadilla into 8 triangles with a pizza cutter. Serve hot.